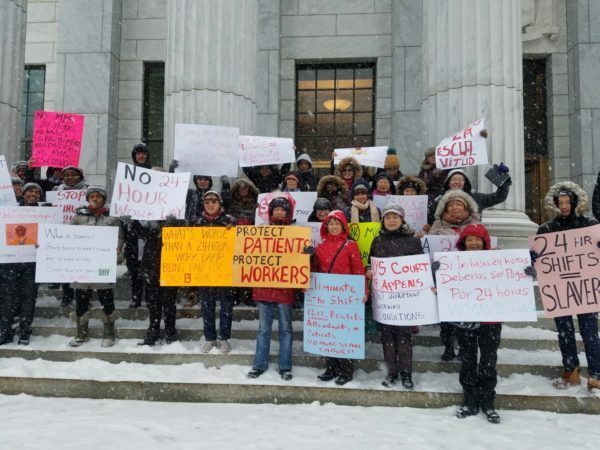 NEW YORK, N.Y.—Home health-care aides trying to get paid for their full 24-hour shifts got a hearing in State Supreme Court Aug. 29—and no response from Gov. Andrew Cuomo and his primary challenger, Cynthia Nixon. Home health aides rally against 24-hour shifts. The aides, organized by the Ain’t I A Woman? Campaign, are suing the state Department of Labor to demand that they get paid for all 24 hours they have to stay with a client, instead of the 13-hour maximum set by emergency rules the department has promulgated three times since last September. The campaign, organized by the National Mobilization Against Sweatshops & Chinese Staff & Workers Association, also sent letters to Cuomo and Nixon asking them to endorse paying workers for the full 24 hours. But the two said nothing about the issue during their contentious hour of debate, which did not touch on labor issues until the last 20 minutes. The state argues that the law exempts live-in caretakers from being paid during the 11 hours a day they are scheduled to be eating or resting. The aides argue that in real life, they don’t get those 11 hours off: They are constantly on call when they are staying with clients, and often have to wake up in the middle of the night to turn them over or take them to the bathroom. They contend that the emergency rules thus violate the state minimum-wage law. They are asking the court to order the Department of Labor to rescind the rules, ensure that no similar legislation is enacted, and declare 24-hour workdays illegal, with round-the-clock care provided instead by two workers, each doing 12-hour shifts. 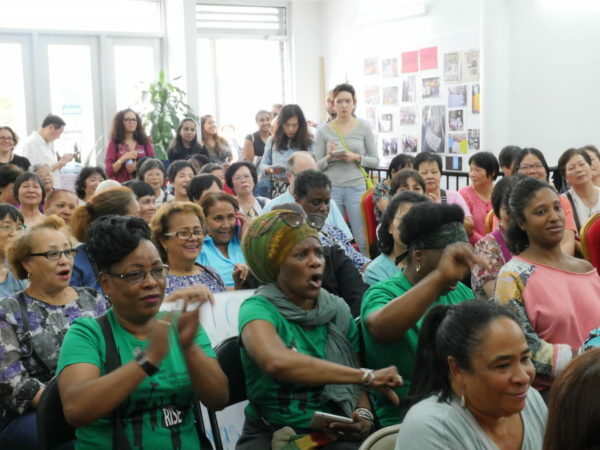 The dispute goes back to 2010, when the state legislature, as part of the Domestic Workers’ Bill of Rights, removed an exception for live-in health aides from the state’s minimum-wage law. The Labor Department responded by declaring that a 1960 rule that “residential employees” didn’t have to be paid for time they were on call also covered “live-in” workers who spend nights at the client’s home, but live somewhere else. Home health aides appeal to gubernatorial hopefuls Andrew Cuomo and Cynthia Nixon for help. 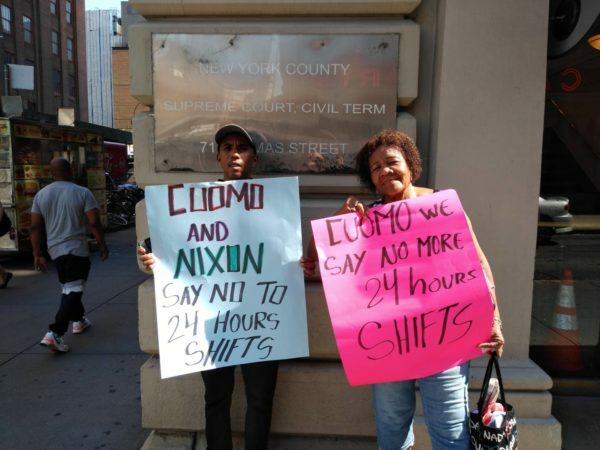 In the lawsuit contesting that rule, home-care aide Maria Gotay of the Bronx says that she is never able to sleep through the night while working 24-hour shifts, as her bedbound client’s care plan requires that she be turned every two hours. 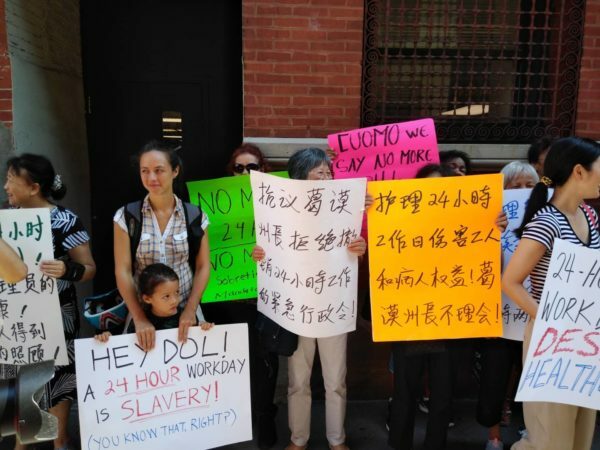 Hui Ling Chen of Brooklyn, who has been working 24-hour shifts as a home-care aide since 2005, says she rarely gets more than a few hours of sleep during her shift, as her client goes to the bathroom multiple times per night and has to be turned every few hours. The home-care agencies that hire them pay them for only 13 hours.